Something similar happened here in the village of Alfred, New York, though the circumstances were rather different. 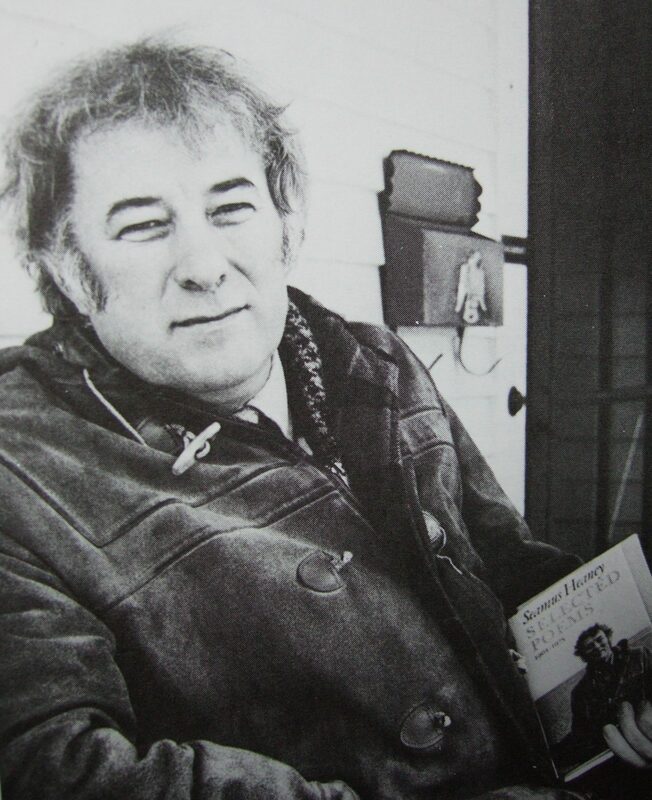 Seamus Heaney visited Alfred University in January, 1984 to give a reading. He stayed in the home of Carol (“CB”) Burdick, an adjunct professor of English who frequently hosted visiting writers. At the time, Seamus was suffering from a toothache, and for most of his reading he kept his palm pressed to his cheek. Early the next morning, he assuaged his pain by writing a piece of light verse, a self-ironic poem modeled after William Dunbar’s “Lament for the Makers” (1508). As he was leaving, Seamus thanked CB for her hospitality and presented her with the handwritten manuscript. I remembered Dunbar’s poem, and Seamus Heaney’s playful appropriation of it, when I learned that Seamus’s last words, texted from his hospital bed to his wife, Marie, were Noli timere (“Don’t be afraid”). As has been widely noted, those ancient biblical words in an extinct language were transmitted via a contemporary, virtual, and inherently unstable medium. Words in cyberspace can disappear in a second — or last, it would seem, forever. Given Seamus Heaney’s stature, noli timere may well take its permanent place among the last words of major authors. But over time it may also be lost, the uncertainties of literary reputation and the swift obsolescence of digital formats being what they are. Such was the fate, in any case, of the handwritten manuscript Seamus gave to Carol Burdick. For decades the poem hung in its frame near her woodstove, a souvenir of a gracious poet’s visit. When the ink began to fade, CB made a photocopy of the poem and put it away for safekeeping. After her death in 2008, however, both the original and the copy disappeared. Efforts to find them proved unavailing. Readers of this column may remember that its title is a translation of the Japanese motto ichigo ichie. Closely associated with both the tea ceremony and the practice of Zen, “one time, one meeting” reminds us that every moment of our lives is unprecedented and unrepeatable. Each encounter is unique. By practicing with this motto, we awaken to that reality, and we train ourselves to experience each new “meeting” afresh. At the same time, ichigo ichie reminds us that what we are presently experiencing will not recur. However indelible it may seem, it is by nature impermanent. Taken to heart, this recognition may cause us to become better archivists: to preserve what we can of the present moment. But it may also prompt us, in accordance with Zen teachings, to contemplate and realize the truth of impermanence, not as a lofty concept but as an immediate, concrete fact. “For Ben Howard,” wrote the late W.D. Snodgrass on a broadside he gave me thirty years ago. “May his nails, his loves, his poems / last.” Unfortunately, De wrote that inscription in impermanent ink, and it has all but vanished. * Irish Times, September 2, 2013, p. 1. I’m sorry De’s inscription faded away but am glad to know you remember it.